The Manhole Odor Eliminator is a carbon filter system designed to remove odors from sewer vents, grease traps, combined sewer stormwater systems, storm drains and other manholes. Each filter cartridge contains activated carbon filter media. 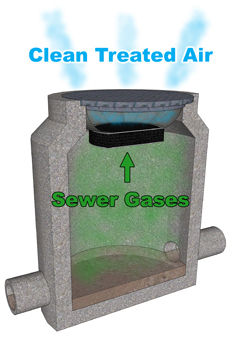 This filter media can remove large amounts of hydrogen sulfide and other odors from sewer manholes. 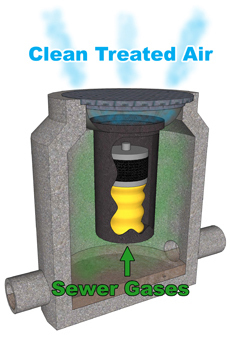 The Manhole Odor Eliminator is a complete odor control filter system. We are currently testing manholes for hydrogen sulfide gas concentrations. Contact us for more information on having your location included in our study. The Manhole Odor Eliminator is designed so that contaminated air enters the filter through a hole in the bottom of the cartridge. Air is then dispersed through activated carbon before exiting the filter. The manhole odor eliminator is equipped with an air bladder. The bladder buffers the frequent fluctuations of sewer gas. The odor absorbent carbon only has to treat the peak flow rates. The filter cartridge is supported by either a plastic or stainless steel frame. Sewer gases escape from manhole covers and cause nuisance, health and safety problems. The ambient air flow into manholes and the sewer gases flow out of manholes is caused by many factors including sewer system design, operation, time, chemical and biological, environmental and other conditions. These conditions result in fluctuating pressure and flow of air and gasses through manhole covers. On extensive sewer lines with multiple manholes only some of the manholes may have severe odor problems. A pre-formed insert is fitted under the manhole cover and an odor absorbing media treats sewer gases before exiting manhole cover. This is considered an improvement in reducing odor complaints. The problem with this method is a short cartridge life, high cost of cartridge replacement and service. Health and safety issues from hydrogen sulfide and other gasses occur during each service along with disruption of traffic in the service area. 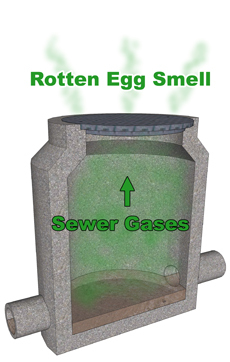 The Manhole Odor Eliminator is the latest patented sewer odor treatment method. This engineered device is considered a substantial improvement over prior art. This product includes many of the prior art items and features plus a variable volume device (bladder) that acts to accommodate the frequent fluctuations of pressure and flow that affects sewer gases and ambient air flow in sewer systems. The expansion and contraction of air and gases from thermal temperature changes and plumbing cause flow in or out of the manhole. The bladder captures a portion of this flow and only the flow exceeding the bladder capacity allows sewer gas to pass through the cartridge and exit the manhole. This feature substantially extends the life of the activated carbon filter cartridge many times. The Manhole Odor Eliminator is very good at eliminating the odors from grease traps. Shallow grease traps can be fitted with a customized unit. Manhole Odor Eliminators also work well in septic systems, sand-oil interceptors, fountain water storage and other underground vaults. Custom support frames can be made to fit round, rectangular or any other shaped manhole cover. 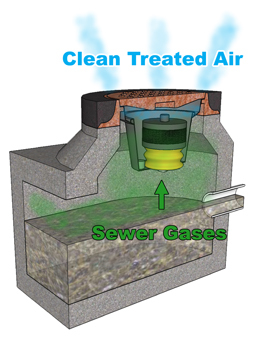 The Manhole Odor Eliminator also works in storm drain catch basins. Both in stormwater systems and in combined sewer stormwater systems. The combined system uses the same activated carbon filter cartridge and bladder of the standard Manhole Odor Eliminator. The stormwater bypass allows water to flow through the system while still sealing the gasses in the storm drain. Combined sewer stormwater filters are also fitted with a rain deflector cover to prevent saturation of the carbon filter cartridge.